38 www.coalage.com November 2018 operating ideas continued cue teams met to develop and imple- ment a competency-based assessment tool for the company's upcoming annual refresher training. The company's first step was to imple- ment a pen-and-paper knowledge check during its 2018 annual refresher training. 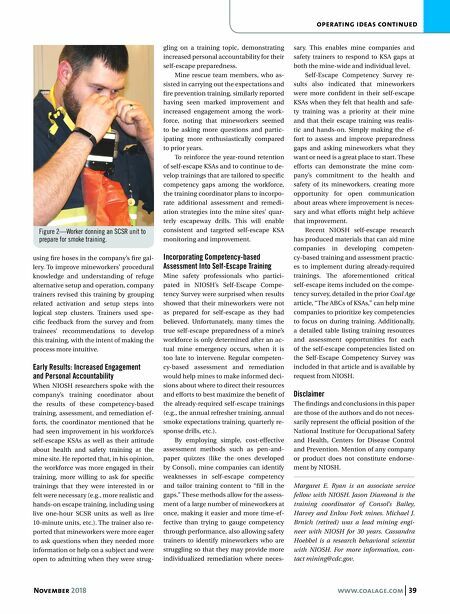 This knowledge check included detailed questions about items from the Self- Escape Competency Survey, along with additional questions that safety personnel believed were important for self-escape. For example, "where your SCSR caches are located" was a competency survey ques- tion; therefore, Consol included "name the specific locations where SCSRs are kept at your mine" on its knowledge check. The training coordinator also incorporated mine-specific questions (e.g., where fire extinguishers are kept at the mine site, how many gallons of water the mine site's diesel fire cars hold and their locations, etc.). Trainers also asked questions about what types of topics and exercises the workforce would like to see added to fu- ture training sessions. The training coordinator administered the knowledge check at the beginning of each annual refresher training session, after giving a brief overview of the gener- al results of the Self-Escape Competency Survey as detailed in the January-Febru- ary Coal Age article, "The ABCs of KSAs." The trainer indicated that he presented this information before administering the knowledge check in order to help mine- workers understand that they aren't alone if they are less than fully confident in any of the self-escape competencies and to en- courage honesty in their responses. After reviewing each mineworker's annual refresher knowledge check, the training coordinator found that about 10% of the workforce needed remediation in one or more critical self-escape KSAs. At the individual level, safety trainers identified specific workers in need of KSA improvement and developed individual- ized remediation approaches to improve the mineworkers' self-escape competen- cies. At the mine-wide level, the training coordinator worked to incorporate KSAs that were in need of improvement into fu- ture training and assessment procedures and materials. The training coordinator followed up with those mineworkers who responded incorrectly to key self-escape KSA items during their next shift. The safety trainer worked one-on-one with individuals on the KSAs that they struggled with in an attempt to improve their knowledge and confidence. Mineworkers were encour- aged to ask questions and to give their candid feedback to the trainer, to help him understand why they were still struggling on the identified item or items, and what types of training or exercises might help them improve. This feedback, paired with the general results across all of the mine- workers, helped safety trainers identify key areas to focus on when developing their future training. Next Steps: Incorporating Results Into Subsequent Trainings Some key areas in need of improvement among Consol's workforce were mine map symbol and lifeline symbol knowledge, what to expect when wearing an SCSR, how to enter the mine's refuge alterna- tive, and how to fight fires. Thus, Consol built training and assessment elements on these topics into the annual smoke/SCSR expectations training and developed a supplemental firefighting refresher train- ing to deliver on the same day. Consol held this training in a three- entry simulated mine, a portion of the locker room that was renovated to serve as the location of this smoke exercise (Fig- ure 1). Each year, the layout of the simu- lated mine is different from the year be- fore and trainers incorporate new sce- narios, obstacles, and challenges into the training exercise. Firefighting training is held in the fire gallery after the expecta- tions exercise is completed. To challenge mineworkers on their mine map symbol knowledge and map reading abilities, trainees were required to walk through the simulated mine be- forehand, mapping out the "mine" layout, (e.g., location of escape routes, primary and secondary escapeways, lifelines, SCSR caches, telephones, power center), and noting other simulated "mine-specific" characteristics (e.g., man doors and cross- check curtains). Groups of four to six trainees then were required to use this map to simulate escape when navigating through smoke during the expectations exercise. After the exercise, trainers met with each group to review their performance and the maps they had drawn prior to completing the exercise, and to offer feedback and answer questions when necessary. When mineworkers were asked to report any requests and/or recommen- dations for future trainings during their annual refresher quiz, a large number re- quested more opportunities to use actual live SCSR units instead of expectations units during expectations training. In re- sponse to this feedback, Consol trainers collected the about-to-expire Ocenco M20 and EBA 6.5 SCSR units that were in need of refurbishment and offered minework- ers the opportunity to don them during the smoke training (Figure 2). Prior to sending the units for servicing, trainers were able to use them to allow minework- ers a more realistic experience on what to expect when opening, donning and wear- ing a real SCSR. 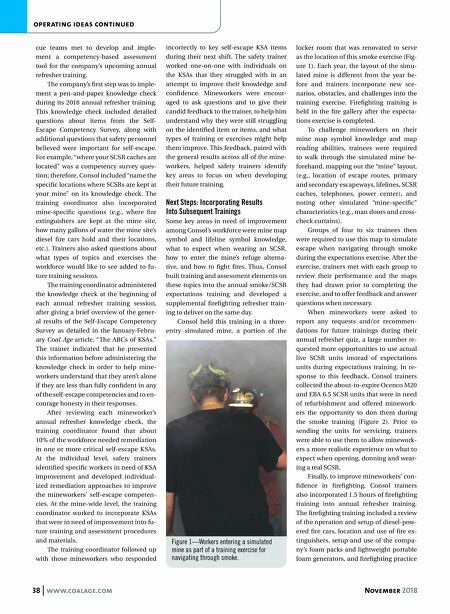 Finally, to improve mineworkers' con- fidence in firefighting, Consol trainers also incorporated 1.5 hours of firefighting training into annual refresher training. The firefighting training included a review of the operation and setup of diesel-pow- ered fire cars, location and use of fire ex- tinguishers, setup and use of the compa- ny's foam packs and lightweight portable foam generators, and firefighting practice Figure 1—Workers entering a simulated mine as part of a training exercise for navigating through smoke.